A man who shook his baby son to death in an "act of deliberate violence" has been jailed. Prosecutor Andrew Thomas QC said Gildea had admitted causing Alfie's death in an "act of deliberate and unlawful violence which involved rigorous and violent shaking". 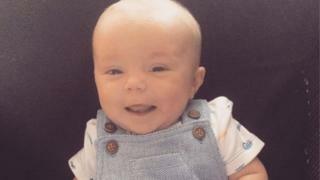 The court heard Alfie's mother Caitlin McMichael had called the ambulance service to say her baby was not breathing. He was taken to hospital where staff restarted his heart, and Gildea was arrested after his son's injuries were deemed to be non-accidental. The baby's life support was turned off the following day. The prosecution said Gildea was also controlling towards Ms McMichael and had accused her of cheating on him. He had grabbed her face or neck and pulled her hair, as well as threatening more serious violence and was arrested in July last year after a neighbour reported him. He was then given a domestic violence prevention order which banned him from contact with Ms McMichael for a month. Speaking after the sentencing hearing, Ms McMichael said: "I will never watch my boy grow, receive a card on Mother's Day or hear him call me mummy." Det Ch Insp Colin Larkin said it was a "truly heartbreaking" case.